On 7 July 2017, Pome Technology, which is based in the Chinese province of Jilin, became a member of Watershare, a consortium of renowned water research organisations whose ambition is to apply worldwide expertise to local water challenges. 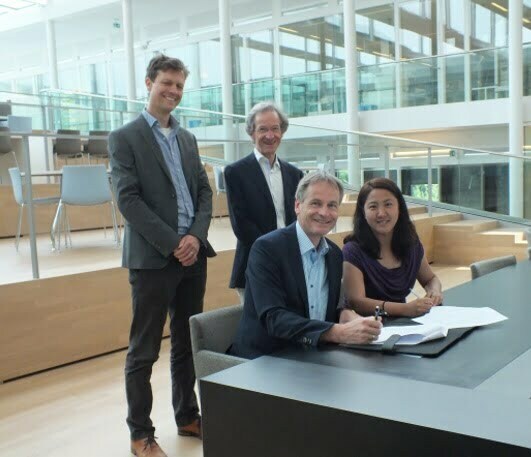 During a meeting at KWR in Nieuwegein, Pome Technology’s Chief Technology Officer, Bo Wang, and KWR’s Deputy CEO Jos Boere signed the membership agreement. Pome Technology provides industrial energy-saving solutions based on the Internet of Things (IoT) and data-driven technologies. Pome aims to help their customers save energy and costs, as well as improve public safety and the environment, through continuous innovation and collaboration with experts from industry and science. Pome Technology’s Chief Technology Officer Bo Wang and KWR’s Deputy CEO Jos Boere sign the Watershare Agreement in the presence of KWR Senior Researcher Peter van Thienen and Watershare Programme Director Theo van den Hoven.